Just wanted to wish you and your family a very Merry Christmas and Happy New Year. Bella is now 1 year, 4 months old, weighs in at 43 pounds and is just such a joy to have in our lives. She is one classy lady and loved by all. We bought a puppy from you in September of 2011. You named him Tucker and we kept his name. He is coming up on 5 years old now. He is the most amazing and lovable dog! My girls just love him to death and so do I! Here are a couple of pictures my 13 yo took last weekend. Kodiak was his father! Thanks for sharing the love of our lives! quick note to say how wonderful he is! What a great dog. He has a great temperament, high intelligence, and is incredibly handsome. Just wanted to touch base to let you know that Cranberry n.k.a. Elphie (after Elphaba in Wicked) is all settled in and "living the life"!! Teagan and Elphie are the best buddies and we are all in love! Of course she is growing way too fast!!! Have a wonderful and relaxing Thanksgiving! I hope this note finds you well. It's Grace's 1st birthday tomorrow, Nov 20th. I took this picture of her last week. Thought you'd like to see her. She is great girl. We are so happy to have found one another. All the best to you and yours. 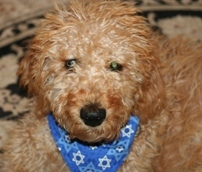 I wanted to thank you, Kari and Doug, for carefully breeding and caring for your adult dogs and their beautiful pups. Thank you for providing a 4 week training option with Gayle Mulvey. Admittedly, the last 4 weeks seemed to pass at a snails pace, but we are now reaping the benefits, Rudy, at 12 weeks, has joyfully walked into our home with exemplary puppy manners. Rudy seemed happier, more adaptable and better socialized than any of our previous pups due to the training month. Everyone meeting our precious pup is blown away at our pups obedience and control. What a dynamic duo you both make ,,, Best Breeder and Skilled Trainer - respected friends working together to ensure wonderful family dogs. Here they are! We are just sending an update. Lulu is now six and Ferris is 3. This year they passed the test to become certified therapy dogs. We love them to infinity and beyond.... 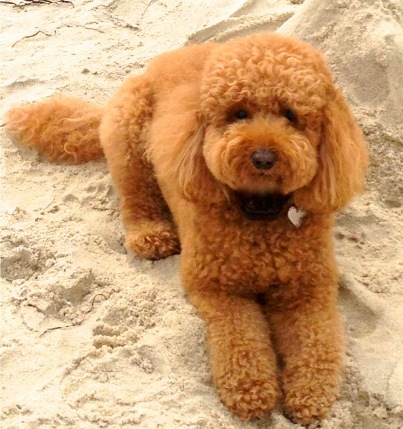 They are such sweet, well behaved dogs, loved by our family and everyone who meets them. Just thought you would want to see how they are doing. Indy has stole our hearts! The boys want to name him Blaze, so Blaze Indy it is!! His crate was dry when we finally got him at 7:00. They would not unload the plane due to lightning. He was calm and tail was wagging! He slept like a champ in his crate in our room and no accidents in the crate or inside. Thank you for this little guy, he has found a forever home. I can't wait until we have more space so we can get another doodle! PS. We even made her own Instagram account. You can follow her at lalawalabear . Aiko is one of Kona and Kodiak's pups born 3/1/2006. We just celebrated his 7th birthday, and it's hard to believe we ever existed as a "family" without him. He is the best, most well rounded, loveable dog I have ever known. He is such a huge part of our lives. He goes everywhere with us, makes everyone's day brighter, and sleeps with my daughter every night. He has been a wonderful since the day we got him and has been a pleasure to train and hang out with. He spent two weeks at an overnight camp in New Hampshire with us last summer, and when we left there were hundreds of kids who needed to hug and kiss him goodbye. I thought it was time to send you a note and tell you that whatever magic you are working into your breeding, keep up the good work! We cannot thank you enough for being the "cupid" that gave us this absolutely perfect dog. I am enclosing some pictures so you can see that he also turned out to be quite handsome! I just wanted to let you know that Lincoln (Jon Jon) is doing great and he's the best dog in the world. Thank you again for allowing us to be part of your family. I have to keep my daughter off your website as she wants Lincoln to have a sister. I hope all is well. We are the family that you helped in Kentucky about 4 months ago to get our wonderful boy "Patriot", now named Tommy. My daughter Mallory, has been changed forever by this little guy. They have a bond that is unlike anything I have ever seen. I can never thank you enough for the gift you have given to us! We love this boy so much! I just wanted to say thanks again and wish you and your family a very Merry Christmas and Happy New Year! We count you among our blessings this year! 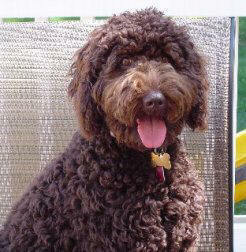 It’s Andrea from Short Hills NJ (Lucy, below, formerly Vixen, from Violet & Kodiak November 1, 2009). My brother and his family adore Lucy and they watch her for us any chance they can get. They’d love to have one of her siblings. Hope you’re all well and look forward to hearing from you! Thought you might like to see how much Autumn is growing. She's up to 10 lbs now. I'm not sure what we did before we got her, cause all we do now is play with her. :). Just wanted to send you a few pictures of Wrigley (and Roxy). 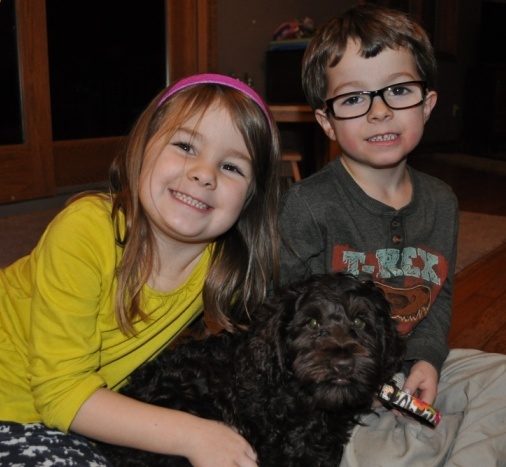 Wrigley is adjusting well to our family! Our boys were very surprised and excited on Christmas morning. Wrigley is very playful and maybe a bit too playful for Roxy! She's an older girl and likes her beauty rest. It's funny when Wrigley starts to play with our cats, Roxy comes to his defense and chases the cats away! Wrigley has a great personality and is very well mannered for a puppy. He loves the snow and runs in circles in it in the backyard. Attached are a few pictures. Well send more as Wrigley grows. Thanks again for Wrigley! He is very loved! We made it home to some really happy kiddos! I have attached some pictures! She is so cuddly and loving. I think she is a perfect fit for our family! Pure Perfection in every way!!!! It has been a long time but you have not been forgotten. Sydney has grown to be a wonderful sweet companion and I love her to pieces. She is a little spoiled but she is the only child. She is now 8 years old. Do you believe how time flies. Hope all is well on your end and my best wishes for a happy and healthy holiday season. when someone isn’t feeling well and will sit or lay quietly at their side while they pet her. 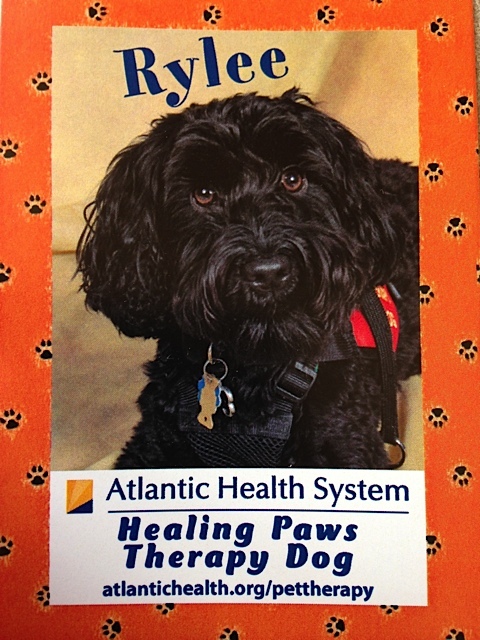 We are very proud of how Rylee has taken to pet therapy. She is the perfect dog for the job! Well Shogun is twenty weeks old now. Here he is at the sit position. Training is going well. He walks great on a loose chain, and he sits in this position until release by another command. He does well in the down command but is still a bit stubborn. I also have been training him to stay in a particular spot until released and he is doing very well with that. Overall is making very good progress. He is the baby of the family and everyone really loves him. Everyone that sees him thinks he is adorable. Just keeping you posted..
We are so deeply in love with this dog!! It's hard to remember life before we had her. She adjusted very nicely to her new home. She and our cat were getting along and the cat was very interested in her, dare I say he really enjoyed her. Two weeks after we got Rylee the cat took ill and had to be put down. 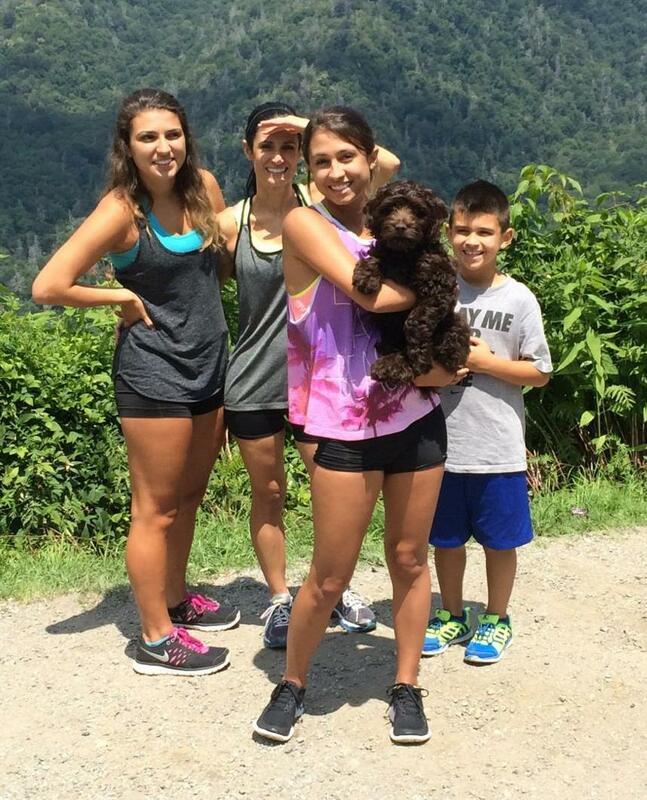 Our family was incredibly sad, and I think Rylee understood that something bad happened. 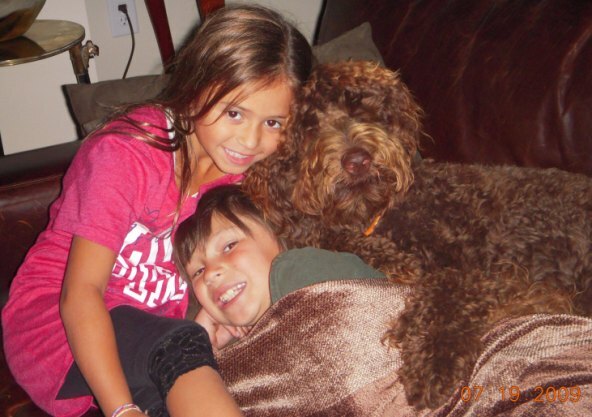 Having Rylee in our lives and home cushioned the blow for all of us and she helped us heal. As they say, timing is everything and she is just what we needed. We've had Rylee for two months now, and in that time she has learned so much. Without jinxing myself, I'll say that she house trained within a few weeks. 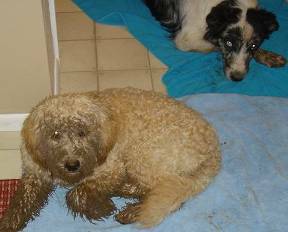 Sure, she thought the rug was a great place to pee and poop when she first got here, but she quickly learned that outside was even better. Alyssa trained her to use the poochie bells in just a few days and now she rings them when she has to go out. We even put a second set of bells in our family room and she learned to use them if we are all sitting in there. She graduated from Puppy Kindergarten this week and begins basic training next week. She has learned to sit, down, down stay, high five, shake hands, spin, roll over, fetch, come, and is working off leash to heel, stay, and come when called. She learns so fast and is really fun to train and play with. I've been taking here with me everywhere and she melts hearts wherever she goes. She loves the car, kids, adults, other dogs, even the vet and groomer. People can't get enough of her! We are working with her to not jump up on people when someone comes to pet her. As hard as it is for her to not jump, she really works hard to sit first before petting. I really believe that she will make a perfect therapy dog and I also think she can be scent trained to detect low blood sugar. Once basic training is complete, I plan to start with scent training. A friend emailed me last night asking to meet Rylee. 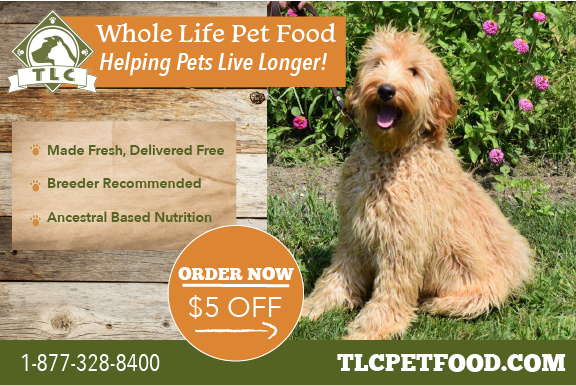 They are thinking of getting a dog so I sent her the link to your website. After looking at all your babies, it's hard not to get another one!! Thank you for selecting Rylee for our family. She has exceeded all my expectations and she amazes me every day. We couldn't love her any more and she has brought such happiness to our family. I will keep you updated with her training progress. Just sent you a picture that I like to call double doodlicious. So, we took our boys to the airport. While we were waiting for "our friend," we game them a small box and in it was a leash and collar, plus the ID tag with the name "Ferris" on it. (Our family is a big fan of the movie Ferris Bueller's Day Off." 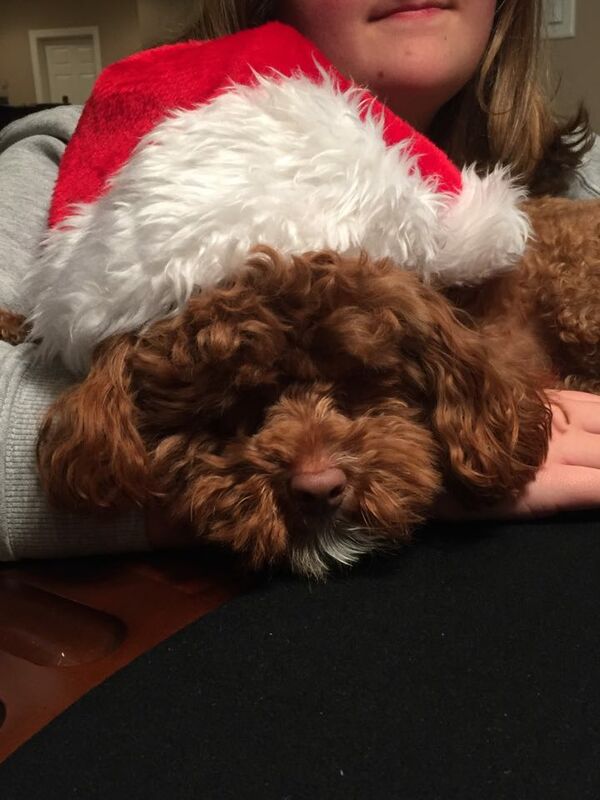 Thank you for giving us another gift of puppy love. Next week Wolfenstein "Wolfie" will be 5 months old. He is a little over 25 lbs now and is fully housebroken. He is doing so well with his training.....he is happy, playful, sweet as could be and the softest boy we could have ever hoped for - inside and out. He had his final shots today and is super healthy. His vet adores him. I hope you are all well and enjoying the new double blessings in your lives and the rest of the kids & puppies (big and small) are doing great! 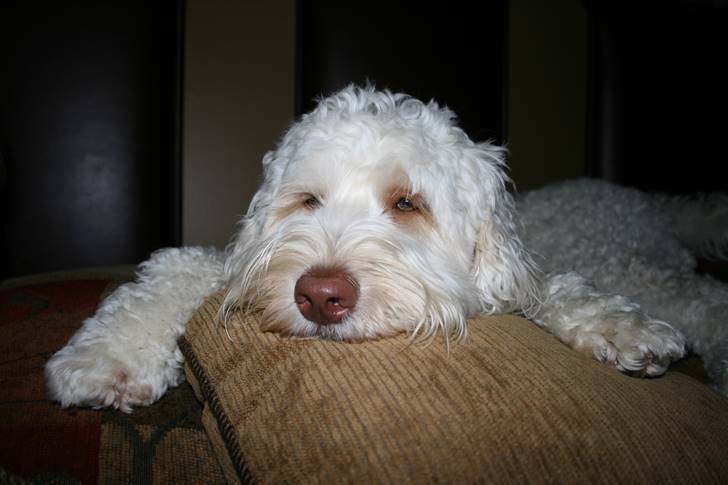 Now I understand how hard it is for you guys to truly capture how gorgeous your Labradoodles are in pictures. It is so hard to get the camera to feature their incredible coats and the awesome character in their faces. But, I keep trying and learning. God bless you guys. It is not easy. All that matters is we know how stunning he is. I am eternally grateful for the gift you gave our family. We are giving him a lot of love. Merry Christmas! I just thought I would send you a note on Paisley...she is the most amazing dog I've ever had and I've had dogs all my life. I swear she's part human. She is so loving and caring about every single thing I do, she's my shadow and I love every minute of it :) She's a favorite at work ( I work for a veterinarian ) and she loves the dog park! I cant keep her out of the water either!! Paisley has the best personality I could have ever wanted in a dog! Thank you so much!! 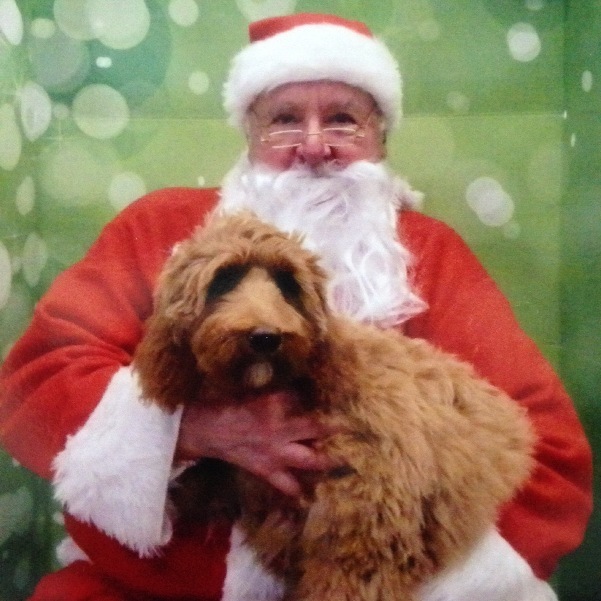 The attached picture is Paisley on Christmas 2010 and she's currently at 28 lbs! Last November I adopted Toffee, born on August 16, from you. I remember that you like to keep up with your adopted puppies so I thought you would like an update. He is now named Tanner and has settled in nicely. 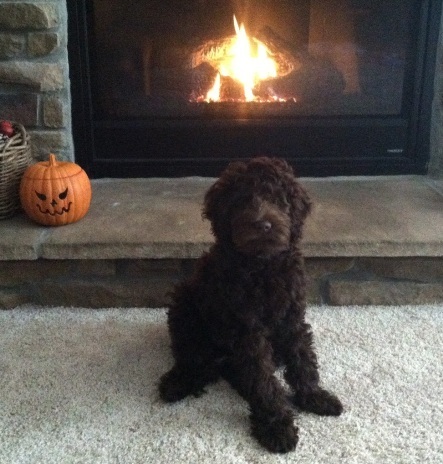 The picture attached was taken in October so he is about 14 months old. We spend a lot of time throwing frisbee in the yard (the mere mention of the word "frisbee" gets him into a huge frenzy). It is his favorite toy. He also loves to play in the fountain we have in the patio behind the house and to chase his rubber bouncing ball. He definitely thinks he rules the house and that I live here with him! As you can see from the picture, he is quite the poser. He went through beginner training this year and did very well except that the trainer says he really has butterflies in his brain. He gets so easily distracted. He has a great personality and everyone that meets him falls in love immediately. Thanks for giving him such a great start in life. He is truly a best friend! Just wanted you to know that we are so thrilled with Vinni and he makes us smile/laugh every day. He's such a smart and sweet dog, and loves to be around the family. We are so glad we adopted him from you and appreciate your giving him a great start. 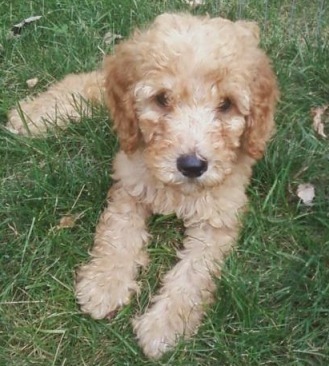 The picture attached was taken the day we brought her home. She is already up to 10 lbs. getting bigger each day! We picked her up at your house on the 4th of July. You're husband was standing at the door holding her and I thought to myself, I sure hope this is our puppy he is holding because it was "love at first sight". I'm sorry I wasn't able to meet you after all our emails back and forth but Doug was so nice and took care of all the business. The 3 hour ride home was no problem at all. She slept on my lap for most of the time with just one potty break. She is so beautiful. I just can't stop looking at her cute little curly face. I love everything about her. Her coloring is a combo of Lucy and Rudi which is perfect and her BLACK nose just tops it off!!! You were so right in your email when you told me. "She is exactly what you are looking for". She is doing so well. Housetraining is going pretty good, only a few accidents. We started puppy classes last Friday and she learned how to sit, come, stand up and lay down after 1 class. My husband is amazed at what a calm puppy she is. Don't misunderstand, Daisy does have her energetic fun and crazy moments like when she does her "puppy run" around the yard and makes us laugh so much! She loves to walk around with my husband when he waters the flowers and she loves to play in the daylilies and sit on the flowers! We've only had her for 3 weeks this Sunday but I don't know what I did before we had her. pup is a real hit on our block. Every one who saw her said she was so cute. As you can see he loves to ride in the car. He puts his head on the center console and stares at me when we drive. I love the first pic on the left that shows him smililng :-D Also, he likes to ride behind the seat belt. I have to fasten it or it beeps, so he sometimes crawls behind it! He is such a good dog! Just wanted to say Hi and tell you how much we are all enjoying him. But he is definitely Nick's dog. They are crazy about each other. Charlie Brown wants to make it, "Three men in the tub." The timing of our puppies last year, allowed us to become the favorite gift of the season. The emails and phone calls blessed our whole family. "We are tooooo busy playing with our new puppy. We are calling him Cooper. He is so happy, playful, and loving, not at all afraid. Our two children (16 and 18) are on the floor with him, laughing at his antics. 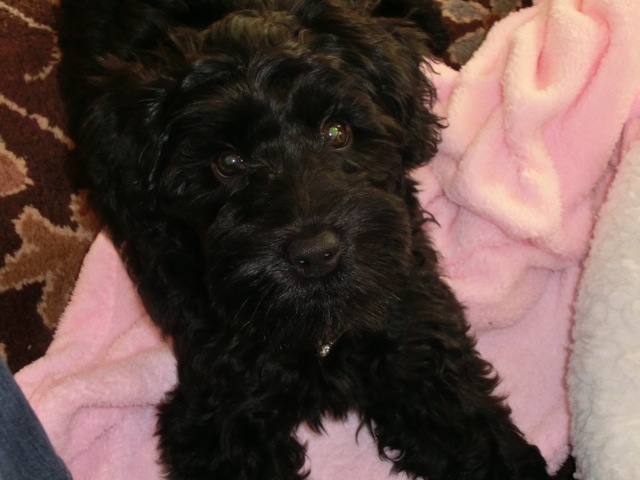 Thanks soooo much, he is already a part of our family from the first minute he kissed our fingers through the crate." Susan, John, Kristen and Ryan from Denver. "We are still loving every minute of Ebony although the boys are considering changing her name to "Chuey" as that seems to fit a bit more but nothing has been approved by mom/dad. She is the most sweetest puppy ever and is bringing so much joy to our boys, especially my son with Tourettes/OCD. We let her sleep with him until it is time for us to go to bed, then we put her in her kennel. They are forming a very strong bond! All the elderly people loved seeing her and she got lots of hugs and petting that morning! I hope you had a wonderful Christmas, you made ours the best in the world!!" 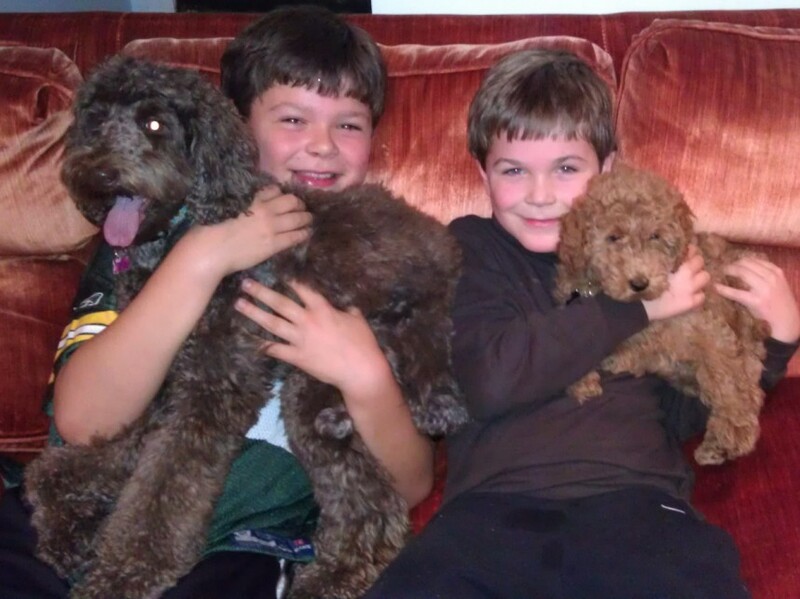 "Our sweet puppy arrived and was a total surprise to our boys.... our 10 year old said, "This is like something out of a movie, getting a puppy for Christmas!" She seems very lively and happy (also snuggling a lot) and ate a good dinner this evening which made us feel good that she was not too stressed. She's too cute and we named her Darby." Noelle, Georgia. 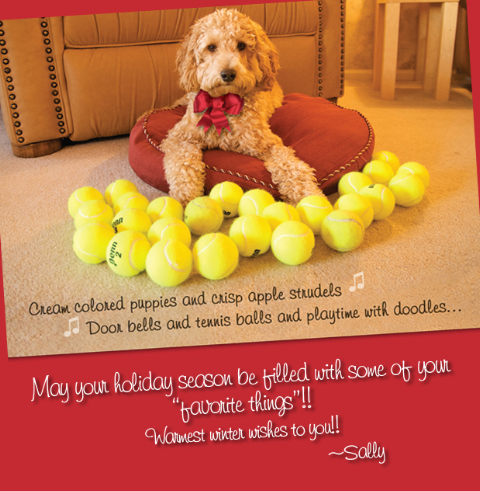 I just wanted to send my holiday wishes to you and your family. 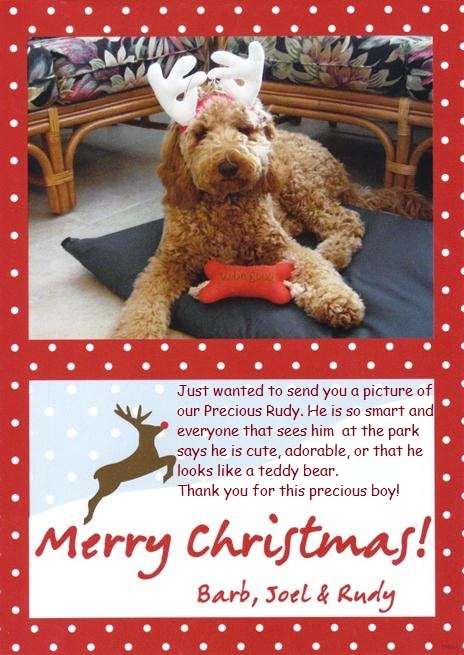 Attached is the holiday card I sent out this year featuring my doodle Duncan (from Maggie-T.J. litter 12/23/08). He just turned one today. I attached a pic that was featured on a doodle calendar for 2010 (he made August) He is a total blessing. Such a sweetie. send pictures. Thanks again for all your help. 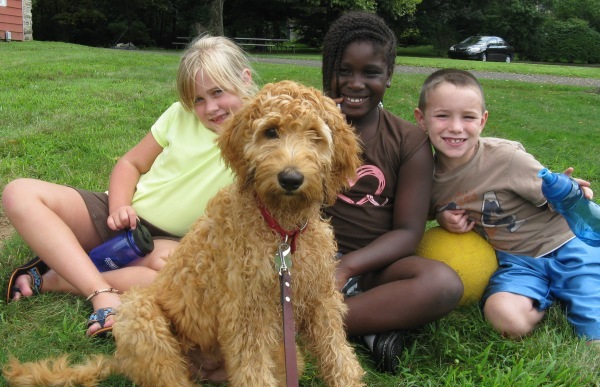 I just wanted to share a picture of our sweet, adorable Lucy with some of the children from our summer camp. She absolutely LOVES the children and they in turn just love her! She is quite a social gal and she just completed puppy kindergarten. She turned four months old and weighs about 29 pounds. She is the best antidote for the empty house syndrome and my husband and I are having so much fun with her. I'm Dean, Visnja's husband and happy owner of Charlie. He's a wonderful little puppy and seems quite happy in his new home. He's also very intelligent and is finding his place in our pack quite quickly. He also sleeps a lot during the day and especially after a big run around outside. He is sleeping though the night as well and wakes around 5:30am. little head off. Sophie loves to cuddle up on the couch to watch television. We recently completed our Basic Obedience class and are looking forward to joining the Advanced class this November and achieving her CGC award. Her newest trick she loves to show off is rolling over on command. She loves meeting new people, especially new people with dogs. Her best friends are our neighbors Boxer Rudy and my best friends English Bulldog Cali. Sophie really is the sweetest dog and I've enjoyed her very much so far! Murphy is such a sweet little guy, so well socialized. I feel very grateful to have found you and him. If he had been my first pup I would certainly be on the list for another one from you. I’m pleasantly surprised to see Murphy and Bear getting along better than I expected, at this point. They are sleeping on the couch, together, as I write this. They are not at the cuddling point yet, but Bear is getting used to having someone close to him when he sleeps. Everyone we meet just loves the looks of Murphy and his easy personality. I can’t wait to see how he matures. He already knows “sit and down” and walks pretty well on the leash, when he is alone with me. I feel like my little family is complete. I just wanted to send you a note and a few pics of Finn. He is just over 4 months old now and is absolutely wonderful. He had a little face trim the other day so we can see those beautiful eyes again and weighed in at 24.9 lbs at his 4 month check up. What a great guy he is. He has been house trained pretty much from the first week and he now rings a bell hanging from the door to let us know when he wants to go out. He is so social with everyone we meet as well as other dogs, even though he was a little cautious for the first few weeks with any dog bigger than him. Not anymore!! He is playful and great with the other dogs but is a gentle loving boy at home. So far he is keeping his color but with his face trim we can see more Uluroo. I hope things are going well with you. 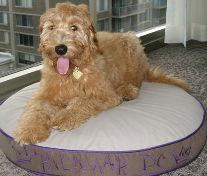 We continue to enjoy visiting your website and see his siblings and "cousins" as they come along .More beautiful pups. Thank you so much for such a beautiful smart healthy and loving dog. We absolutely love her! She is adorable and smart. Only one accident in the house so far and she can sit on command. It’s obvious she was well cared for and loved before she came to us. Looking forward to many years of happiness with her. Sadie is adjusting nicely and she and Chance are having a good time, but Chance is also having an adjustment period and he does not want to share the love the rubs, hugs, and kisses. 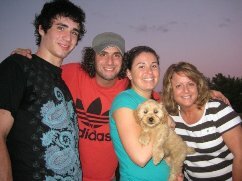 I think this is a great photo of how happy a pup can be with his family! He looks like he is in heaven. Just a brief update about this fantastic pet you provided for us. She has a taste for mice. Her and Bindy both seems to relish life out in the pasture digging up mice that live under my irrigation pipes. We love her to death but we had no idea how much she loves that water. I have to chase her out of the calves water. When it gets hot she thinks the waterers are her swimming holes. We couldn't have asked for two better pets for us empty nesters. Thanks again Kari!!! Callie is a blast!! Hi, Kari. Yes, she's scary! It seems she has "wired into" our thoughts. She has found that Joe and I are creatures of habit and seems to CORRECTLY anticipate our next move and is there when we get there. She is a wonderful dog, great friend and companion and such a therapy friend. But, she does not have to try. It is so comfortable, natural for her to do. It is just Presley. Thank you again for the wonderful friend we have. She makes us laugh and cry. She is silly and mature. She knows just when we need those kisses and never fails us. She senses the unspoken and soothes with her kindness. She knows when Damon feels well, or when things are in a little slower mode. She adjusts and never arrives or leaves him without kisses. She is so great! She gives herself unconditionally ....without a thought. I can't say enough. I will send more pictures soon. Thanks you all again. Becky. Brady our loveable boy is doing great! He is loving the beach at lake Michigan. He is small at 10 pounds but eats like a champ, we all love him dearly! Kari and Doug here is a photo of Roscoe who is now 3 months old. He weighed 5.4 lbs on his 1st the day after he arrived and 6.5 two weeks later. He is a great little guy with lots of personality. He slept through the night in his crate from the very first night we had him. Yeah Roscoe! After 3 weeks he is not totally housetrained, but we have him on a regular scheduled for visits outside that has minimized the number of accidents. Roscoe is really smart and affectionate. 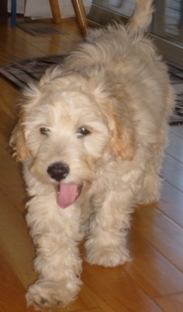 He is exactly what we were hoping for in an Australian Labradoodle. I just wanted to drop you a line to let you know how great Jake is doing. 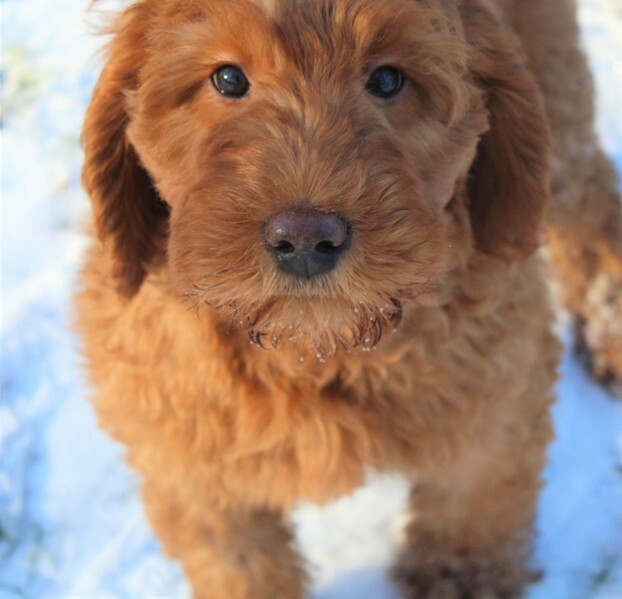 I have to tell you that he is absolutely one of the most beautiful doodles that I have ever seen. We are stopped constantly and asked about him. His face has the sweetest expressions and my boys just adore him. I have never had one day of regret about getting a second dog. Her name is Leila. She is beautiful, happy, playful, calm, well-socialized and smart. She has not had one accident in the house. She has her potty spot on our lawn. She slept through the night last night from about 10-5:30, woke up and went potty, played for an hour and went back to sleep until 8. She has a crate with a divider. We keep the door open and she goes in and out of it all day. She brings her toys in there to play. Leila is comfortable around all of the neighborhood dogs. She acts like she's known all of them her whole life. My kids take her everywhere in the neighborhood to play with their friends and go to the park. Leila is so comfortable. She just goes with the flow and seems so laid back in her new home. We could not have gotten a better dog. Thank you for everything! I wanted to drop you a note about our growing Cooper. What a joy in our lives!!!! He has been an incredibly happy, well behaved puppy who is now pushing about 25 pounds! After a few challenging first days...he quickly settled into our home. He has done very, very well with crate training and comes to work with us every day. I know you will be happy to know that in 3 months with us he has only had a handful of accidents....and even with his serious puppy energy, he hasn't been the least bit destructive. 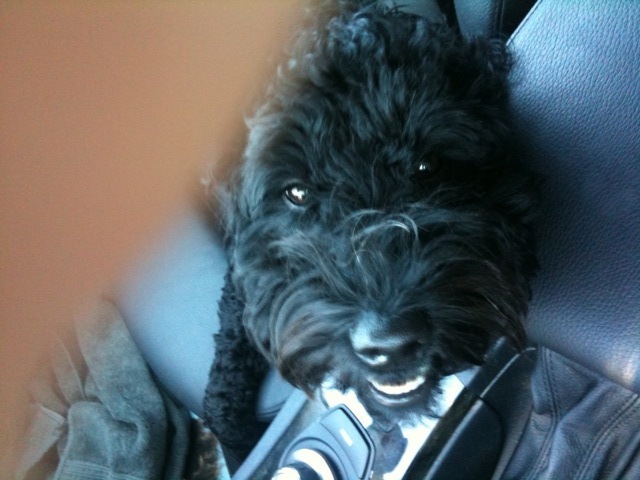 He's comfortable driving, playing, walking in the city or in the park. We feel fortunate he was born in your home....because the "chaos" of your loving family with lots of kids has made him immediately comfortable with our family, friends and coworkers. He especially loves our nieces and nephews. 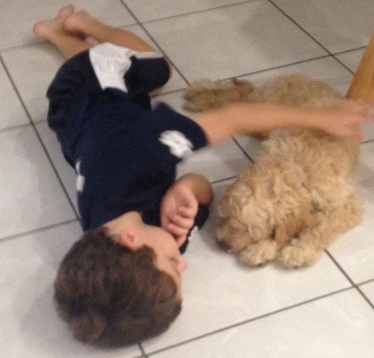 The only time Cooper pulls on his leash is to get to children so he can give them his love. Thanks again for making our family complete this year! I hope your families are doing well this holiday season, we send our love! Dixie understands when we say "Grandma and Grandpa are coming" and barks and starts running around just like the kids. It is so funny. Once we were in the car driving to visit my parents and Roman said, "this is Grandma's road", Dixie stood up in her crate and let out a big bark-yelp type thing and we all laughed. She is the smartest dog I have ever met! Riley has turned out to be a wonderful dog. He is so sweet and easy to train (although his owners haven't been so good about him jumping on people coming to our door!). He has truly become a member of the family and he "forced" me into a great routine of walking several miles a week.I so appreciate your help in those first few weeks and am glad it all worked out and that I endured through it! 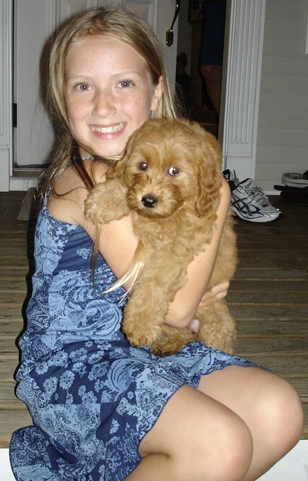 My daughter, Maddie, still takes great care of him and we visit the website frequently to get a glimpse of the new pups. I keep threatening to come just for a visit but my husband is afraid that I won't leave without another puppy! Hello Kari. 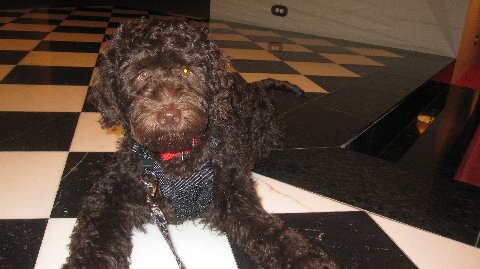 Just wanted to send you a few pictures of our 21 month old labradoodble, Jake. What joy he has brought to our family. His gentle nature and intelligence is such an amazing combination. So many people have stopped by our home to ask what kind of dog he is because he is so cute and well behaved. We have recommed you often to friends looking for a dog and Jake's cousin became part of our neighbor's family just this past fall. Dear Kari & Doug, Just thought I would send over a few pictures and let you know how I'm doing. I am growing like a weed, I weighed in today at 42lbs. and I am only 41/2 months old. I'm a "BIG" boy! My Mom & Dad they're the best.... They really spoil me! They call Simba the King and I am the Prince.I graduate from puppy school in 2 weeks, I am sooo smart! Sometimes I eat something I shouldn't ( like my Mom's shoes) I only do it to keep them on there toes. I wish you and your family a Happy and Healthy New Year. Thanks again for the wonderful puppy. We are having so much fun with Diego. He is like our little child. We could not have asked for a better puppy. Just wanted to update you on Murphy! He is doing great and is the sweetest, smartest, most wonderful dog! We are so happy with him, he is such a great addition to our family. He is so playful and friendly and loving and amazing with our boys. Its hard to believe we have only had him for 5 weeks. He is basically housebroken, he goes to the door when he needs to go out. We couldn't be happier with him, thank you for such an amazing dog! He is about 14 pounds now and at least from the pictures on your website he looks just like his daddy! 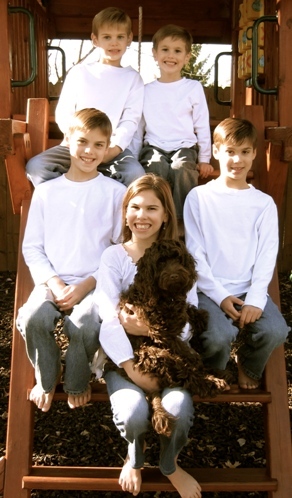 I am attaching a picture of Murphy with our boys - it was just taken on their first day of school. 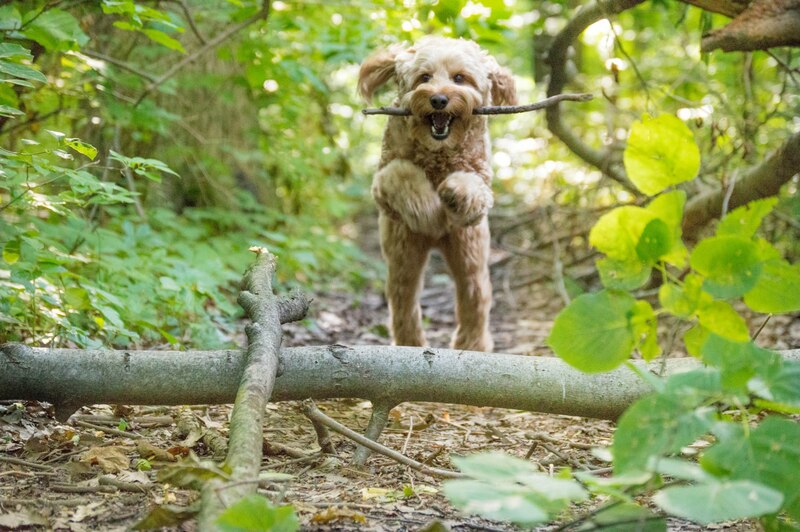 We have been recommending you to all of our friends who are considering getting a dog! He did so good. No accidents so far. He is just a lover. Loves to hug and kiss. My four year old says he loves me now that I got him his puppy:) He slept in his crate all night with no fussing. We had his crate in my bedroom. The four year old slept on a futon next to him all night. He did not fuss in the morning either. He just wiggled around in the crate. I let him out. He went #1 twice and #2 once. He is quite good. Thank you sooo much for the great book of instructions. That was very helpful and gave me a lot of confidence. Also, thanks for the great communication. I will keep you posted. We already love him. It was instant. Sampson is doing so well...growing and getting cuter everyday! :) Here is Sampson and I just last week before my concert. We're from Virginia and we purchased our "Macy" from you in February 2006. She is from a litter between Bella and Kodiak. 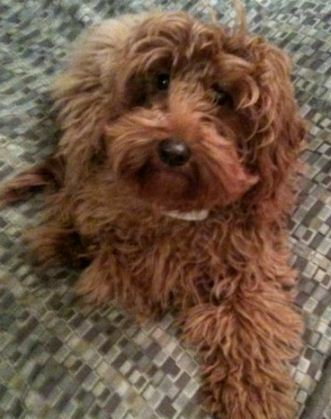 Well, I know you hear this all the time, but Macy truly is "the perfect dog!" She's been a great addition to our family and we couldn't love her more. She's beautiful, has an even/gentle temperament, is loving/playful/smart, etc. We are so thrilled to have her in our family! Just thought I'd give you an update on Mackenzie's 18 month progress. We have completed novice obedience class. She participated in a "Show 'N Go" obedience trial (just a practice trial, nothing official) this past Sat. 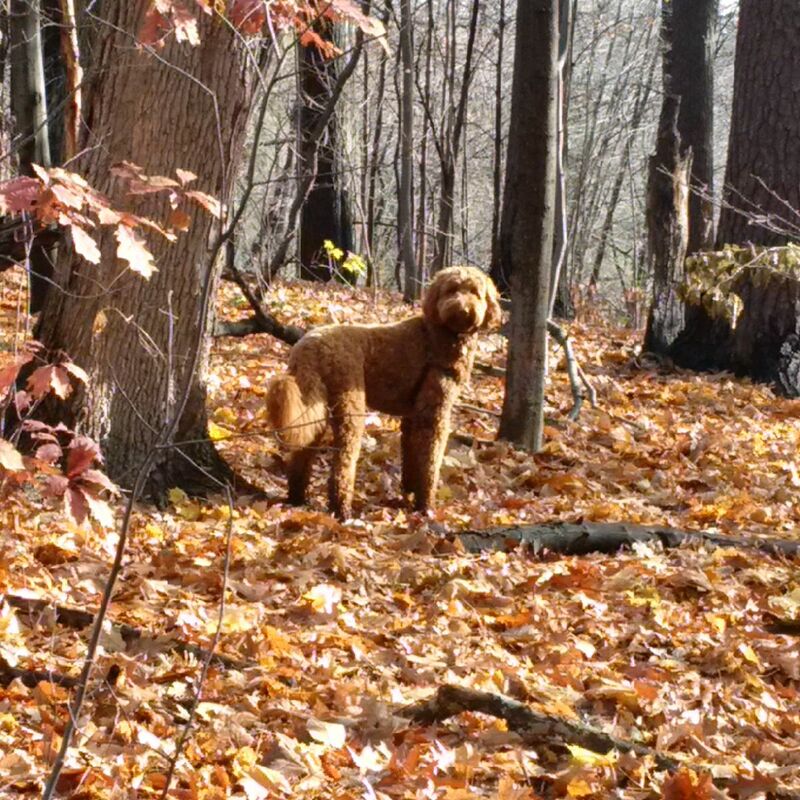 She was off leash and did well for the first time in such a situation. However, it was clear where we need more work! We will start agility class in August. We think she will enjoy that because she creates her own obstacle course in the back yard, and she's a great frisbee player. She is such a great dog. Very lovable and lots of fun. Lucy has added so much to our lives. She is doing remarkably well (not that I'm prejudiced or anything). She is a hit with our community and at the vet's office. The vet's office has a groomer onsite and we took advantage of a special puppy grooming offer. 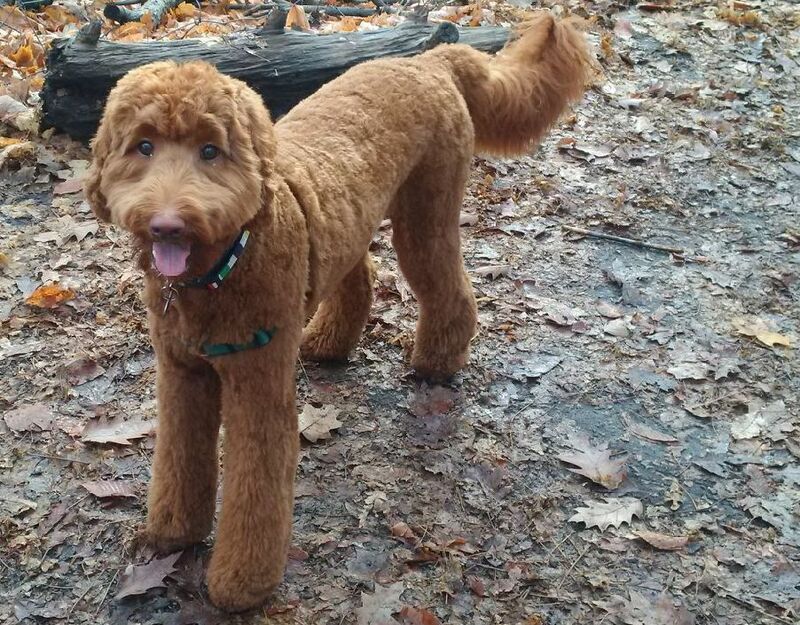 The groomer owns a goldendoodle so she was familiar with the coat type -- hooray!! When I get home from work this evening I will give her an extra hug from the Lambert family! I wanted to send you a long overdue update on Chloe. She turned 6 months old last week, and is just a delight to us. She is such a beautiful pup - everywhere we go people ask what kind of dog she is, and comment on how cute she is. She has such a nice temperment - so loving and great with my boys - she loves to play with them, and is so tolerant of them. Chloe loves to play outside - she loves to run as fast as she can from one end of our yard to the next, with her ears flapping in the breeze - boy is she fast. 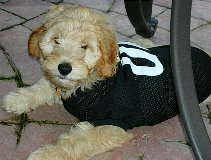 Rugby (still cute a as peanut!) is doing GRRRRRRRRREAT!!!!! He is the most awesome little man! We love him more than words can express! =) I was just visiting your site and saw the precious photos of your red babies!!!!!!! Congratulations on another perfect litter!!!! He is such a lovely puppy. 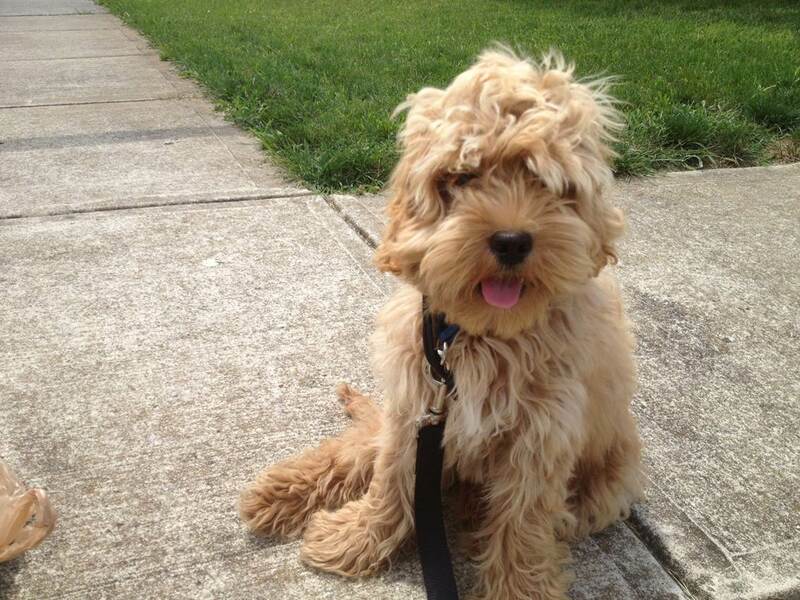 He's almost 8 months now and is quite a hit with everyone he meets and greets in the neighborhood. We've settled into our routine and he goes to the dog park every evening to play with all of his friends. It is truly so enjoyable to watch them all run around and play. We get so many compliments and questions about him--where we got him and about his breed. We are so thankful for him every day--he has brought us unending joy and we thank you again for bringing him into our lives. Just an email to let you know how Bailey is doing. He is a joy! He has had his second vet visit and weighed in at 5 lbs. 1/2 ounce. He is such a sweetheart, slept in his crate at night right away with no problems and still loves his crate. He is happy all the time when he is with us. He loves to ride in the car, too, he just curls up and sleeps. We try to take him lots of places. His first outing when we had him only a few days, was to a high school football game, because we didn't want to leave him home in his crate that long of a time. We took him in a carrier bag which looked like a purse and no one ever knew he was in there. (we kept him in there the whole time because he hadn't had that final Parvo virus vaccination at the time.) He did great!!!! He loves high school football. We start puppy school soon. I'm not sure what happened after we said good-bye. I was in a box and my box moved from place to place. After a long time and many moves, a tall man looked down at me and said, "There you are, Missy! Well, hello! How are you?" Then he poked his fingers through my box to say hello, and I said hello back. He picked up my box and carried me to a bigger box. He put my box inside the bigger box and got inside the bigger box with me. Then the bigger box made a rumbling sound and started to move. It moved this way and that way, sometimes moving slowly and sometimes moving fast. When the bigger box finally stopped, the tall man got out and took my box with him to a really big box. The tall man carried my box inside the really big box and put my box down inside of it. I heard many voices. Then my box opened and I saw three faces smiling at me. At first I did not know what to do. I had been wanting to get out of my box for a long time, but I did not know the faces. After a while, I decided to leave my box. I think that I made a good choice because I found water, a chew toy, and three very happy kids. Since then I have been discovering many new things and having a lot of fun with the tall man, the three kids, and their boss. I am sending you a picture of me as I left my box because I left it for a wonderful place! Please visit me if you ever get the chance. 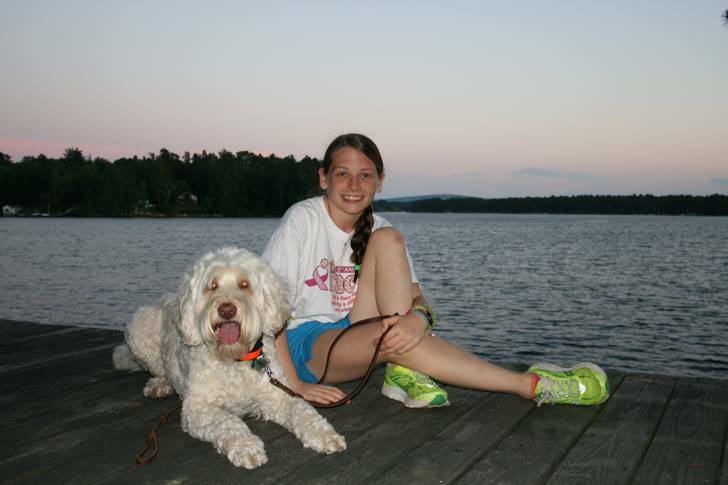 I don't know if you remember me, I'm Valerie Silvestri and we adopted a puppy from you about a year and a half ago. He is cream colored and we named him Max. I just wanted to update you on how everything is, it's great! We love him to pieces. He keeps us on our toes but we love it! He is doing great and everyone loves him. I thought that people used to say how great he was because he was such a cute puppy, but they still say that he is the most well tempered dog that they have ever met and that he has a great disposition. Even though he is not a puppy any more he is still the cutest thing I have ever seen. Hi Kari. Jessie is doing great! She is a big Steeler fan, as you can see from the excitement on her face! Potty training is much improved and she's pretty much over mouthing. She's such a good dog. Take care. Hi Kari and Doug! I hope you and your family are all doing well. We just wanted to say hello and give you an update on how Bailey doing. Yesterday she turned 8 months. She is now 44.5lbs and just too funny. She has wiggled her way into every aspect of our lives and we just love it. She is the mascot for Walt’s softball, the pride of the neighborhood, and everyone just loves her. Since we have gotten her, Bailey has very much developed her own personality. She is energetic at times, dramatic when she doesn’t get her way (she actually seems like she sighs and pouts), and is always so happy to see and meet people. I have to thank you both so much. She has just been perfect. She has her friends in the neighborhood, and her friends at the dog park. Thanks again for our family member! Max is doing AWESOME!!! He is 4 months old now and weighs about 25 pounds. He is house trained now (no accidents for the past month). We have a spot outside next to the side of the house that he goes to the bathroom in. He is great about this as well. 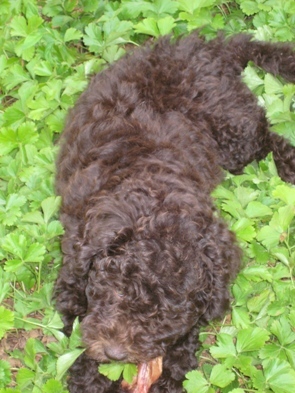 He is still a beautiful chocolate fleece puppy. His coat is Fantastic!!! Wavy and butter soft! And best of all, not one hair has be shed yet!!! He is in puppy school now and doing great. He is picking up all the commands very quickly. My 7 and 9 year old daughters taught him to climb the rock wall on their play set and slide down the slide. It is so cute to watch him do it! J Thanks again for such and awesome puppy!!!!! I cannot tell you how many people stop me to ask what kind of dog he is and tell me how cute he is. My sister absolutely loves him. She's been to my house more times since we got Max then she had been in the 10 years I've been married. When we take him to the vet or to the groomer everyone falls all over him. He is the best dog we could have ever gotten. We can't imagine our lives without him now. I have been giving your name to people like crazy! 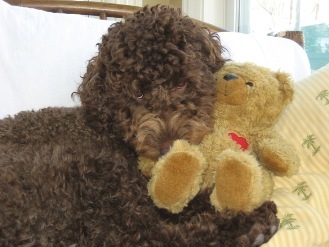 Everybody wants a labradoodle! Kari, I just wanted to pass along the news that Mocha is now a Therapy Dog. Even though she was only a little over a year old at the time, she passed all three testing sessions with Therapy Dogs Inc. with flying colors. The evaluator was totally amazed the first time she met Mocha, because of her calmness, poise and friendliness. I now go on a twice-weekly basis to visit in a nearby hospital and nursing home. One day last week, a lady with dymentia got this really "clear" look in her eyes and talked about the dog she used to own for 15 years. Sometimes the nursing staff gets cheered up by seeing Mocha, and probably passes that right along to the patients. Often, we stop in at the hospice wing and the people there are so touched by Mocha's smiling face! 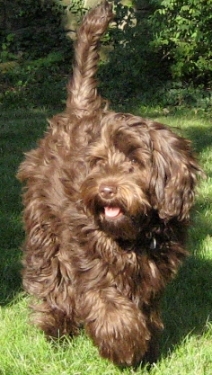 The evaluator wants me to be a part of the Ann Arbor Schools' visiting dog program, where Mocha will go visit classrooms. Hi, Kari and Doug, Just a brief update on Cassie. She has successfully completed "Puppy Pre-school".....complete with diploma. .......she's 98% on house training ...... weighs 22 pounds ...... and not a day goes by that she doesn't make us smile and laugh out loud with her antics. She is sooooooo lovable.She had a wonderful few days at the cottage again...everyone that meets her falls instantly in love........both humans and canines. She is madly in love with a young male Puli that lives across the street. Hope your new litter is as good as this one. Doc had his 2nd vet appt. this Am and weighing in at 17 llbs. We are crazy about this dog. He couldn't be cuter. I'll send pics. He is healthy, close to being house-broken and great temperament. 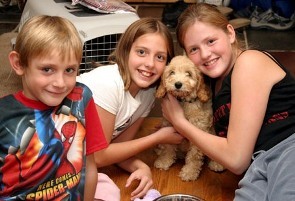 He's the first labradoodle in our town and getting lots of attention at the vets and groomers. Your pups are a wonderful representation of the breed. Thanks again for a great pup! We have had an awesome weekend with Tyson! He is so wonderful, I just cannot tell you how happy we are with him. He is going potty outside and is doing beautifully! Only 2 accidents in the house that were our fault and it's not a big deal on the wood floors anyway. For now I have rolled up my good rugs on the wood floors (I am just going to put them away for a couple of months) and for now he runs around in that area which is a large kitchen/sitting area. Of course when we are in the other areas watching tv or whatever we bring him with us and he sleeps on our lap. His personality is showing more by the minute. He is laid back but so curious and bright. He plays with his toys and seems to be understanding which things are his toys. He already has a couple of favorites and goes to them a lot. He struts around a lot and seems to be very happy. He loves to be outside. He was much of yesterday and "helped" rake leaves. He jumped right in the pile one time. 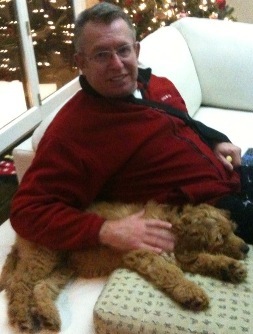 Thanks for your time today and for providing our family with a precious puppy! I can't thank you and your family enough for our wonderful companion. You were so nice to deal with and very understanding of all my emails. You know what you're doing and I am so glad that I found you and your dogs!! I am honestly already thinking about when we should get puppy #2 and aside from Tom, you'll be the first to know. I'll stay in touch and keep you updated as to how Roscoe is doing and also send pictures. Please pass along our thanks to your family and anyone else who had a hand in Roscoe.... especially Caleb's family too! Thank you so much...we couldn't be happier! p.s. I thought Tom would be the most passive about getting a dog, but he LOVES having Roscoe. He plays with him, snuggles with him, and loves the fact that he follows him around and will plop at his feet just to be close. He was home while I took the kids trick or treating. Roscoe was laying by his chair and when the doorbell would ring he'd simply pet him, answer the door then come back. Roscoe would stay put and go right back to sleep once Tom was back in his chair! He couldn't believe how calm he was. Needless to say, we're ALL happy to have him in our family. Just wanted to send you a quick note to let you know how Mackinac is doing. He seems to be adjusting very well to his new home. We just love him. I have never seen such a relaxed dog. He loves to stretch out (and I mean really stretch out) and sleep on the floor. He usually lets us know when he needs to go outside by crying at the door. He spent today "taking care" of our son who was home sick from school. Mack stayed really close and made sure he was ok. Everyone loves him and he really likes to play with the neighbor kids in our backyard. What a great dog! Thanks for everything. We'll keep you posted. 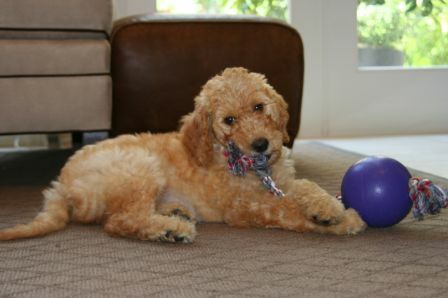 Teddy is absolutey the most adorable puppy. He has changed my life, he is such a joyous fun little dog. Teddy weighs 13 pounds now and looks exactly, and I mean exactly, like Violet. He is house trained and crate trained. He is happy to go in his crate, maybe because I save special treats just for the crate. I can go run errands for 2 - 21/2 hours and he is fine, never cries. Maybe I am house trained but he is only 4 months and 1 week and sometimes he sits by the door and other times he barks to go out. Rarely has accidents I wish you could see him bouncing through the woods you would laugh. We could make a Disney movie of him. He especially likes to leap through the pachysandra. We have had our first "class" and he is so smart! He stays right with me on the leash, comes immediately when I call him, is starting to learn that jumping is not the best way to get a treat. The girl next door is crazy about him and wanted your web site. He recognizes her car and I can hardly contain him when he sees it! People actually stop their cars and ask me about him when we are out walking. 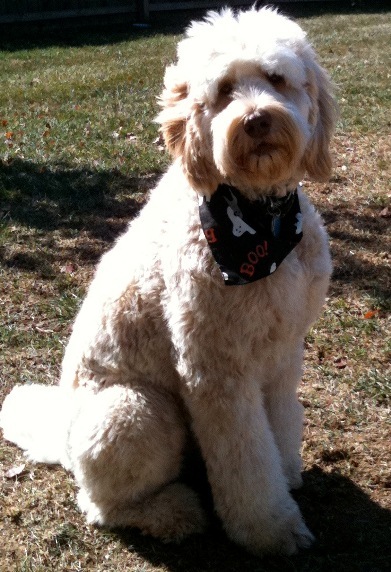 He is a hit at the groomers, everyone wants to pet him He has the most friendly happy disposition. Latte is turning out to be one awesome puppy and a real "daddy's girl" She has had zero (not one) accident in the house so far, loves to just lay on the couch next to me when I am working and loves going for rides in the car. She likes to chew a little so I have to watch that, but what puppy doesn't! Thanks for letting me have her, she is awesome!!!! Hi Kari, it was great to hear from you again. Annie is still doing awesome and we love her so much! She is soooo beautiful! Whenever we take her out, everyone stops us and asks us millions of questions about the breed. 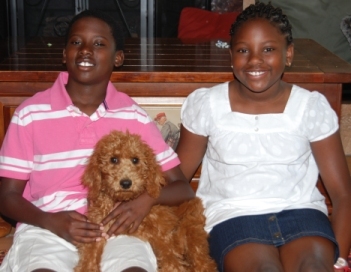 Kari, We want to thank you again for you hospitality today and for letting us see your wonderful Labradoodles. The puppies were cute and well behaved as expected, but the older dogs had the best temperament in any dog I have ever met. 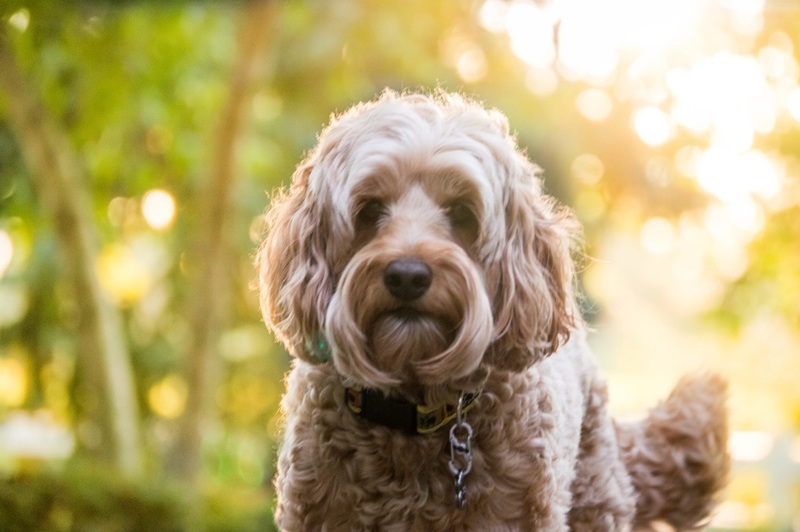 My family always had a dog when I was growing up and there are a lot of dogs through out our family, and I was very surprised at what a good feeling I got from all the Labradoodles. It was much more than I expected. Hi Kari, Just wanted to let you know how happy we are with Didge. He is so sweet and calm!! He slept most of the way home yesterday, no carsickness thank goodness. He also slept all night in his crate without so much as a whimper!! This is too good to be true! Hopefully, tonight will be the same! 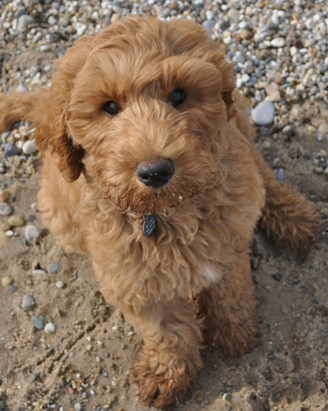 It was nice to meet you and your family and all of your lovely Labradoodles yesterday. We'll recommend your doodles to anyone who is interested! Chauncey is quite the popular dog in the neighborhood. We have had a constant parade of visitors. Mostly kids. Everyone agrees he is the cutest thing around. The drive home was easy. He played for awhile then slept for a good portion of the time in his create. He only cried for an hour each of the 1st two nights in his cage. Now he only barks for 1-2 minutes. But he gets into everything. He has taken to playing with the tags on the underside of the kitchen table chairs. The house training thing is going slowly. We can predict by watching him when he has to go but he has not figured out how to "tell us" he has to go. We took him to the vet and he was the center of attention. No one had ever seen one before. So everyone in the place had to take a look. He has really figured out how to play up his cuteness and get lots of attention. Mocha is doing great! She is doing great in school and with the private trainer, the woman can not get over how smart she is and how cute she is too!!!! We had 2 1/2 feet of snow last sunday and she LOVED it! She hopped in and out of it with the girls and just had the best time! Mocha went to the vet today and she got rave reviews!! Everyone loved her by the time we were finished there were 6 people that worked there hanging all over her!!! He said that she looks great and he LOVED her disposition he said that he felt as though she was going to make a great adult dog. Wembley is wonderful!!! It took him some time to get used to us, but he if now finally being more cuddly. I guess he has soooo much he would rather do than cuddle, like playing with his toys and eating!!! .... He is also soooo funny...He is just perfect!!! Thank you sooooo much for him. ... I love him sooo much. ... Thank You so Much for Wembley, he is GREAT!!!! I'm sorry that I didn't e-mail sooner,, but we have been very busy with Gizmo. He is the love of my life! I can't even begin to express how happy I am with him....Thanks again, and he is adjusting well. He fits right in with my family and life. We couldn't be happier! Melba is absolutely fabulous. Of course the crate sits empty. She sleeps in bed with either my husband and I, Rebekah or Tessa. She makes it from 10:30 to about 7:00, no accidents....You can certainly quote me, you were one of the nicest people I have ever dealt with and I just recommended you to a couple of people who are debating about a dog.